Now that the legalization of marijuana for medical and recreational use has become more widespread, parents and their children have many questions about the drug, what it's like, how it is used, and what effects it has on users. What Is Marijuana? Are There Different Kinds? Marijuana still appears as a green, leafy substance sold in little plastic bags and rolled into cigarettes, but with the advent of legalized medical and recreational marijuana has come the development of many other types of products that contain marijuana. The most popular way to use marijuana is still to smoke it in joints or blunts (cigars stuffed with marijuana), but today's generation of users have come up with innovative new ways to use pot, some developed because they are healthier and some because they are more clandestine. THC, the active ingredient in marijuana, is rapidly absorbed by fatty tissues in the body. But, THC metabolites can be detected for several days after smoking by standard urine drug tests. There is some evidence that THC metabolites can be detected in heavy, chronic marijuana users for several weeks after their last use. Teens who smoke marijuana tend to think that "everyone" is doing it, perhaps because everyone in their circle of friends is smoking weed. But, the evidence tells another story. In 2012, according to NIDA's Monitoring the Future study, only 6.5% of 8th graders, 17.0% of 10th graders, and 22.9% of 12th graders had used marijuana in the 30 days prior to taking the survey. Teens who report daily marijuana use are a much smaller number. In 2012, only 6.5% of 12th graders reported smoking weed daily. Peer pressure may be the No. 1 reason that adolescences begin using marijuana, but it's not the only one. Research tells us that the biggest key in whether a child starts smoking pot is availability; if their friends have it—and especially if it is in their own homes—kids will give it a try. This may come as a surprise, but some people can smoke marijuana and it does nothing for them. Although in the minority, there are those whom marijuana does not affect. Marijuana's effects - which can vary widely from one person to another - depend a great deal on the characteristics of the individual. Most people who smoke pot get a feeling of being relaxed and getting "high." But, according to the National Institute on Drug Abuse, some of the short-term effects of marijuana use are medically problematic. What Are the Long-Term Effects of Marijuana? Scientists are still discovering some of the long-term health effects of smoking marijuana, but some of them have already been uncovered. Research has found that smoking marijuana has been linked with the development of some cancers, immune system disorders and lung and airway problems. Does Marijuana Affect School, Sports or Other Activities? If a child is using marijuana, even occasionally, it can have a direct effect on his or her daily life. The experts tell us the main areas in a child's life affected by marijuana use include learning, participating in sports, and in making good judgments. Long-term studies of high school students and their patterns of drug use show that very few young people use other drugs without first trying marijuana, alcohol, or tobacco. Though few young people use cocaine, for example, the risk of doing so is much greater for youth who have tried marijuana than for those who have never tried it. While research has not fully explained this association, growing evidence suggests a combination of biological, social, and psychological factors are involved. Researchers are examining the possibility that long-term marijuana use may create changes in the brain that make a person more at risk of becoming addicted to other drugs, such as alcohol or cocaine. While many young people who use marijuana do not go on to use other drugs, researchers are trying to determine who is at greatest risk. Do the Doritos keep disappearing? Seriously, if an adolescent is using marijuana chances are they are trying to hide it. But, there are signs they will probably exhibit while they are actually stoned, and there are other tell-tell signs that you can usually spot. Although some of the ingredients in marijuana have been found to have significant medical uses, the FDA has never approved the use of marijuana in any shape or form for the medical treatment of any medical disease or condition. However, smoking marijuana may increase the health risks of using the drug that outweigh any value it has as a medical treatment. Consequently, scientists have converted some of the medical beneficial ingredients of the plant into pill form. Two pills containing marijuana's psychoactive ingredient THC have been approved to treat nausea in patients undergoing chemotherapy for cancer and to stimulate appetite in some patients with AIDS, according to the National Institute on Drug Abuse. In some countries, outside the United States, a mouth spray version that contains a mixture of THC and cannabidiol has been developed for medical use. Current research is focused on finding safe ways that marijuana ingredients can be used medically, without the risks of inhaling dangerous smoke into the lungs. A lot of people who smoke pot and drive believe that being high makes them even better, more-focused drivers, but is that really true? Researchers tell us that initial super-focus marijuana users may experience doesn't last long. There are many other ways weed can affect driving skills. If a Pregnant Woman Smokes Pot, Will It Hurt the Baby? What Happens If a Nursing Mother Uses Marijuana? When a nursing mother uses marijuana, some of the THC is passed to the baby in her breast milk. This is a matter for concern since the THC in the mother's milk is much more concentrated than that in the mother's blood. One study has shown that the use of marijuana by a mother during the first month of breastfeeding can impair the infant's motor development (control of muscle movement). We know more about marijuana's short-term effects on the brain than we do its long-term effects. THC affects the nerve cells in the part of the brain where memories are formed. This makes it hard for the user to recall recent events and learn new things. Scientists do not know exactly how long-term marijuana use affects the brain, but MRI images have shown that there are visible differences between the brains of marijuana users and non-users. 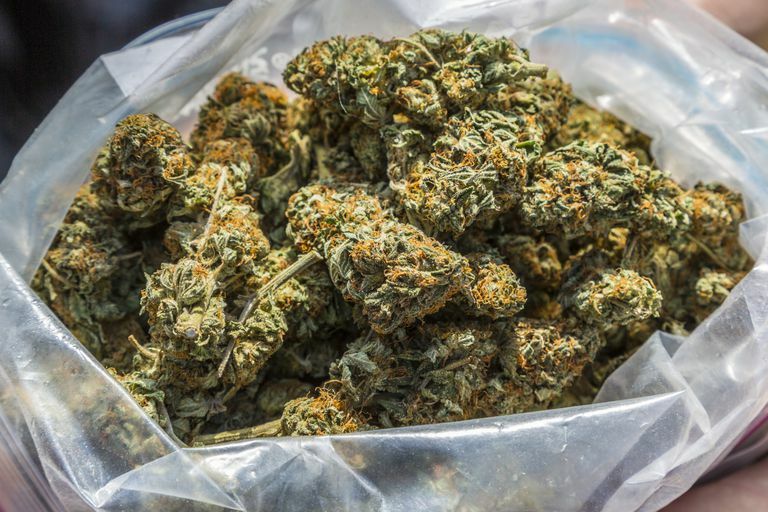 There are those who believe that you cannot become addicted to marijuana, but the National Institute on Drug Abuse reports that about 9% of those who use weed do become addicted. That percentage increases for those who began using marijuana while still in their teens and for those who use it daily. According to one study, marijuana use by teenagers who have prior serious antisocial problems can quickly lead to dependence on the drug. That study also found that, for troubled teenagers using tobacco, alcohol, and marijuana, progression from their first use of marijuana to regular use was about as rapid as their progression to regular tobacco use and more rapid than the progression to regular use of alcohol. What if a Person Wants to Quit Using Marijuana? Treatment programs for people who want to stop using marijuana focus on behavior therapies, because there are no approved medications for marijuana treatment. National Institute on Drug Abuse researchers are testing different methods of helping people stop using marijuana, including some medications. There are a number of treatment programs designed specifically for teens who want to stop abusing marijuana. At What Age Do Children Generally Start Smoking Pot? The official answer is the average age teens start smoking weed is 16, but that is the average age. That means there a many who begin using marijuana before that age. About one in seven 8th graders report using pot. As the legalization of marijuana becomes more widespread, we may see that percentage increase. Can a Pot User Have a Bad Reaction? Some users, especially those new to the drug or in a strange setting, may suffer acute anxiety and have paranoid thoughts. This is more likely to happen with high doses of THC. These scary feelings will fade as the drug's effects wear off. In rare cases, a user who has taken a very high dose of the drug can have severe psychotic symptoms and need emergency medical treatment. Other kinds of bad reactions can occur when marijuana is mixed with other drugs, such as PCP or cocaine. Some of the harm that marijuana can do to teens fall under the heading of "other risky behaviors." If they are using drugs, chances are they may begin to become involved in other activities that are not healthy or good for their well-being. Can Marijuana Cause Mental Illness? Scientists do not yet know how the use of marijuana relates to mental illness. Among the difficulties in this kind of research are determining whether drug use precedes or follows mental health problems; whether one causes the other; and/or whether both are due to other factors such as genetics or environmental conditions. High doses of marijuana can induce psychosis (disturbed perceptions and thoughts), and marijuana use can worsen psychotic symptoms in people who have schizophrenia. There is also evidence of increased rates of depression, anxiety, and suicidal thinking in chronic marijuana users. However, it is not yet clear whether marijuana is being used in an attempt to self-medicate an already present but otherwise untreated mental health problem, or whether marijuana use leads to mental disorders (or both). Do Marijuana Users Lose Their Motivation? Some frequent, long-term marijuana users show signs of a lack of motivation (amotivational syndrome). Their problems include not caring about what happens in their lives, no desire to work regularly, fatigue, and a lack of concern about how they look. As a result of these symptoms, some users tend to perform poorly in school or at work. What is Tolerance for Marijuana? Tolerance means that the user needs increasingly larger doses of the drug to get the same desired results that he or she previously got from smaller amounts. Some frequent, heavy users of marijuana may develop a tolerance for it. How to Prevent a Child From Using Marijuana? There is a massive amount of research that shows that parents play an important role an have a great influence on whether or not their children end up becoming involved in substance abuse as children. This site has many tips and resources for parents who are trying to keep their kids away from drugs. The Partnership at DrugFree.. "Marijuana." Drug Guide. Accessed April 2014. Can I Overdose on Marijuana?